Most of us have wondered whether a decline in the price of a stock we’re holding is long-term or a mere market hiccup. Some of us have sold our stock in such a situation, only to see it rise to new highs just days later. This is a frustrating and all too common scenario. Whilst it can’t be totally avoided, if you know how to identify and trade retracements properly, you will start to see improvement in your performance. Retracements are temporary price reversals that take place within a larger trend. The key here is that these price reversals are temporary and do not indicate a change in the larger trend. A reversal, on the other hand, is when the trend changes direction, meaning that the price is likely to continue in that reversal direction for an extended period of time. Notice that, despite the retracements, the long-term trend shown in the chart below is still intact. The price of the stock is still going up. When the price moves up, it makes a new high, and when it drops, it begins to rally before reaching the prior low. This is one of the tenets of an uptrend: higher highs and higher lows. Whilst that is occurring, the trend is up. 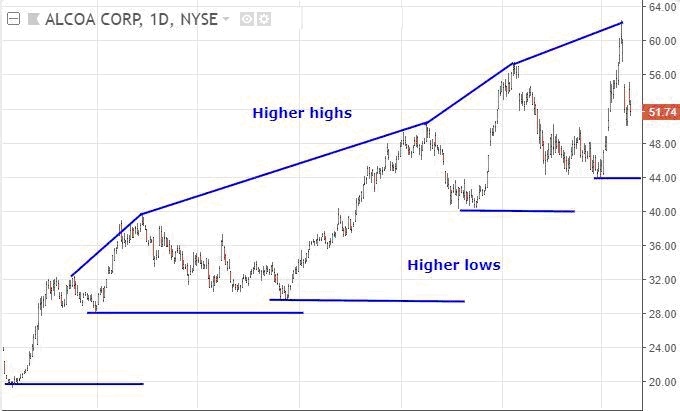 It is only once an uptrend makes a lower low and/or lower high that the trend is drawn into question and a reversal could be forming. 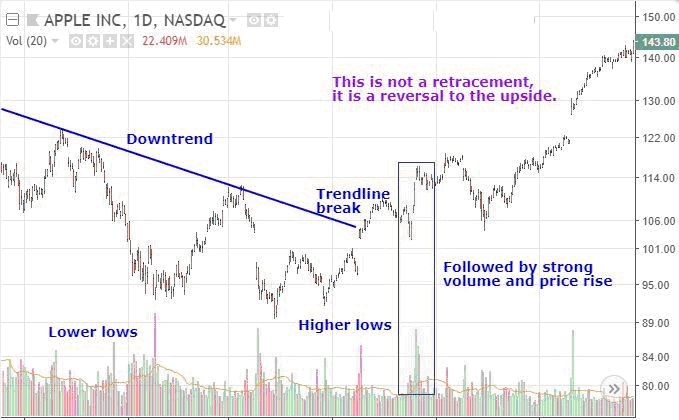 Hold throughout the sell-off, which could result in large losses if the retracement turns out to be a larger trend reversal. Sell and re-buy if the price recovers, which will definitely result in money wasted on commissions and spreads. This may also result in a missed opportunity if the price recovers sharply. Sell permanently, which could result in a missed opportunity if the price recovers. Retracements between 23% and 78% of the prior impulse wave are common. 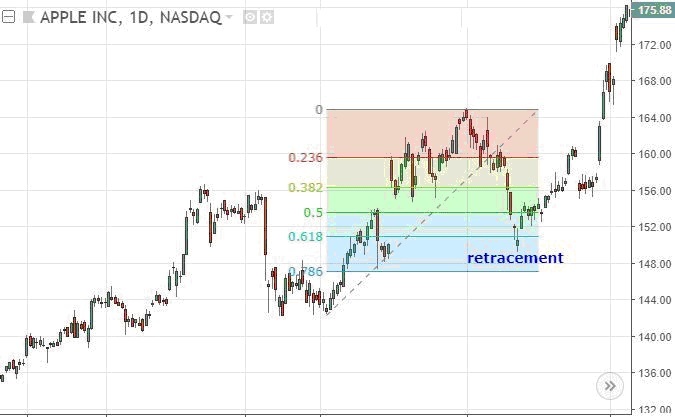 That does not mean the stock falls 23%, rather it means that, if a stock recently moved from $10 to $5, it will often retrace at least 23% of that move ($5), which is $1.15. So a pullback from $15 to $13.85 or even all the way down to $11 is possible. At this point, the trend is still up, assuming $15 was a new high and $10 was the recent low. If the price bounces higher above $10, then the uptrend is still intact, assuming it rallies and makes a new high. If it doesn’t move above $15 and starts to fall again, it may be time to get out. Pivot point levels are also commonly used when determining the scope of a retracement. Since price will often reverse near pivot point support and resistance levels, if the price continues through them, that indicates a strong trend, whilst stalling and reversing means the opposite. Pivot points are typically used by day traders, using yesterday’s prices to indicate areas of support / resistance for the next trading day. Estimate retracement levels using technical analysis and place your stop-loss point just below these levels. Alternatively, you can place the stop-loss just below the long-term support trendline or moving average. 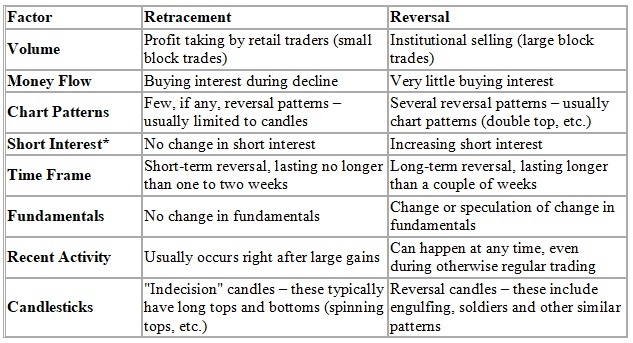 As a trader, learn to differentiate between retracements and reversals. Without this knowledge, you risk exiting too soon and missing opportunities, holding onto losing positions, or losing money and wasting money on commissions/spreads. By combining technical analysis with some basic identification measures, you can protect yourself from these risks and put your trading capital to better use.